Haye floored Ruiz just 25 seconds into the encounter, but the American challenger showed tremendous bravery and powers of recovery to survive. For a short while it looked as if Ruiz was working his way back into the fight. But the badly-marked 38-year-old was down in the fifth and again in the sixth before his corner called a halt three rounds later. "There were a load of fans here. The crowd has been absolutely electric for me. There was a 20,000 capacity here with everyone screaming the 'Hayemaker'. "With performances like that I'll keep the fans behind me. I loved the whole occasion." As expected, Haye, energised by a 20,000 capacity crowd at the MEN Arena, sprang out of the traps at the sound of the first bell and had Ruiz over with his first real attack, a left-right combination right on the button. The American rose but looked unsteady on his feet. 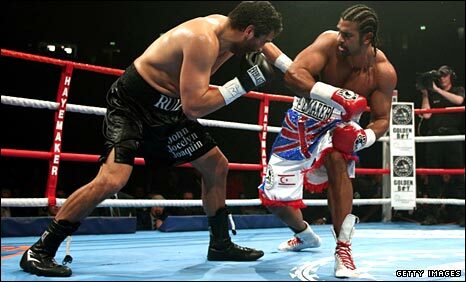 Haye immediately went in for the kill, only for Ruiz to cover up well and somehow managed to remain upright. Ruiz was down again halfway through the round, although this time referee Guillermo Perez judged Haye had hit Ruiz on the back of the head and docked him two points for a deliberate foul. He may well have nicked the second before Haye upped his work-rate in the third, peppering Ruiz with ramrod jabs and rocking him repeatedly with huge right hands. Ruiz had more success in the fourth, with Haye not moving his head as effectively as he had been - and the sight of Haye grabbing his gumshield at the bell suggested the fight was far from over. But Ruiz, who had no answer to Haye's speed, wore a pair of juddering right crosses at the start of the fifth before he was forced to take a knee after yet another massive right hand. Ruiz, his face by now masked with blood, was down for a fourth time in the sixth, this time courtesy of a chopping right hook, and the challenger's trainer Miguel Diaz indicated that the next round might be his final throw of the dice. 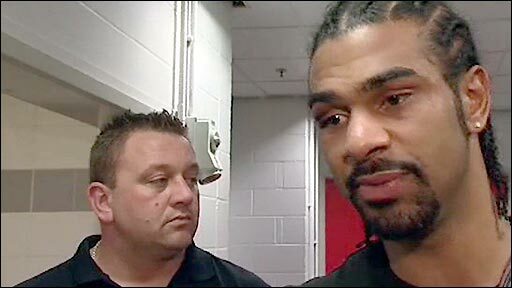 But Haye coasted the seventh, meaning Ruiz, who never stopped coming forward despite the damage he was sustaining, was sent out again. A scything uppercut had Ruiz backpedalling at the start of the eighth and, after another tremendous barrage it looked like he might go over again. 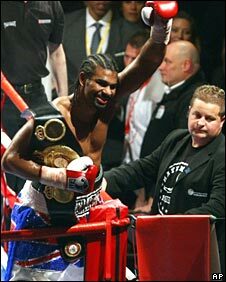 But Haye, feeling the pace himself, stood off. Earlier in the evening, Briton George Groves stopped Ghana's Charles Adamu in the sixth round to win the Commonwealth super-middleweight title. Colin Lynes failed to make it a successful British double after being counted out in the eighth round of his Commonwealth light-welterweight title challenge against Ajose Olusegan of Nigeria.